Data is pulled from MySql database. Couple of questions for someone more experienced with charting. 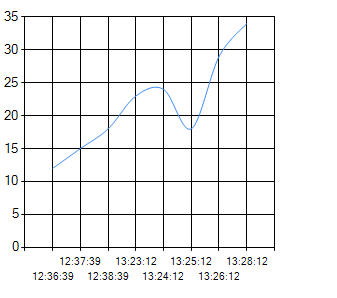 1) The bottom chart, instead of showing the time stamp, shows 200, 400, 600, etc. How can I get the time from the timestamp column to show up? I had the devil getting it this close, because it did not like the time series*. 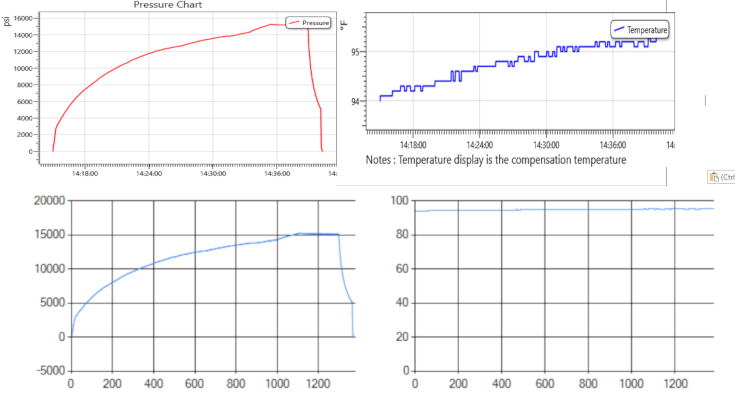 2) The second chart on the right is a temperature chart. It is so zoomed out, you can hardly see the temp rise like in the chart above it. Best way to zoom in on the data and make it look like the chart above it, given the data I have to work with? Seems to be about 400 to 1,200 rows of data per chart. 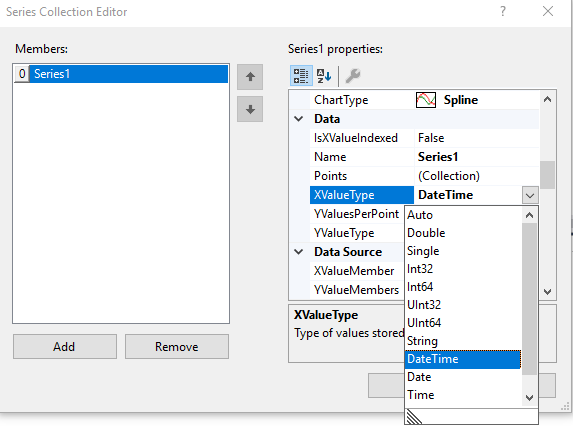 I did fix this error with the above code, though: "asp.net Series data points do not support values of type System.TimeSpan" If someone is searching on this error. You are showing a chart with y axis from 0 to 100, and comparing it to a chart with y axis from 93.5 to 95.5. Change your axis range. 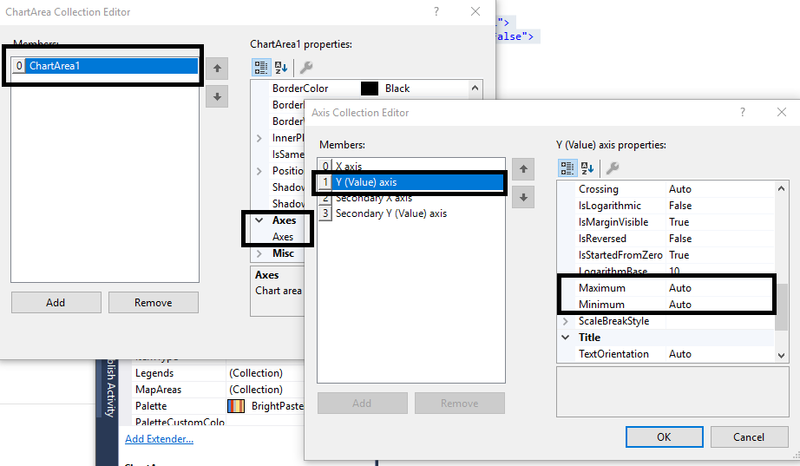 IsStartedFromZero property on the y-axis changes the labeling algorithm so that the chart recalculates values for the Y-axis labels based on the minimum value in your dataset and the maximum value in your dataset. .. or whatever you want to set it to. As far as I know, the chart control in asp.net support system.timespan. I think you could assign the XValueType. I try to bind the following datatable to chart and it works. In addition,as KathyW says, the second question is about the Y-asix range. You could change the range of Y-axis by referring to the following Guide. I actually am working from codebehind, so I didn't have some of the datasource options that you show in your screen shots. Took me a bit to figure out how to manually add them, but I actually got the time to start showing up.